As huge fans of Asian cuisine, we’d been meaning to get to Sugar Cane, near Peabody Square, for quite a while. We’re now kicking ourselves for having waited so long. Aside from one dish we didn’t love, everything we put in our mouths on recent visit was superb, starting with the drinks. We tried a sake-tini, a mai tai, and the zombie. 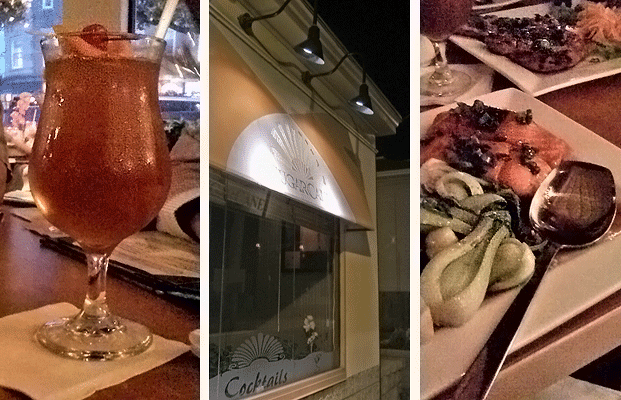 All were delicious, and the mai tai stood out as better tasting than others we’ve had at other Asian restaurants. While sipping, we studied the menu, which includes both Chinese and Vietnamese dishes for each category, side by side. Since Vietnamese is hard to come by north of Boston, we agreed to order from that side, with the exception of the house pan-fried dumplings ($6), which came with ginger soy and were crispy and light—some of the best we’ve had (and we’ve had a lot). The small bowl of beef pho ($4) was fine but seemed bland. When we added the hoisin and hot sauces it came with, though, the flavor came alive. We also enjoyed the banh xeo crepe ($8), a large, crisp omelet with shrimp, pork, bean sprouts, and mung bean. It’s a must-have. The nem cuon summer roll with grilled pork ($6) was billed as a Vietnamese specialty, so we gave it a spin but didn’t like the texture of the meat. More likely our American palates than a miss from the kitchen. All the entrees we ordered were dishes we would have again, starting with the chicken with lemongrass ($10). Wonderful savory flavor with tender meat and crisp-tender vegetables. The kho salmon with baby bok choy ($13) featured two large fillets, perfectly cooked and topped with a delicious spiced caramel sauce. The mango shrimp were firm and good sized, with plenty of mango, peppers, and onions to accompany them ($13). Our last entrée was angel hair Singapore style with curry sauce, chicken, shrimp, pork, peppers, and onions ($8), which was spicy but not overly so and really hit the spot. Next time, we may try the tempting option of creating our own stir fry with many options for meat, vegetables, and sauces. The service was extremely attentive and friendly, with our waiter calling over the manager when he couldn’t understand one of our questions about the drink menu. For those of you who’ve been curious about Vietnamese cuisine, Sugar Cane is a sure bet—and you can go with someone not as adventurous thanks to the Chinese dishes on offer. Stepping into a vintage dining car often gives you the feeling of stepping back in time, but that isn’t quite what happens when you enter the Little Depot Diner. It’s more like you’ve stepped into some bright and happy idealized version of the past, and you’re glad you’ve stumbled upon it. 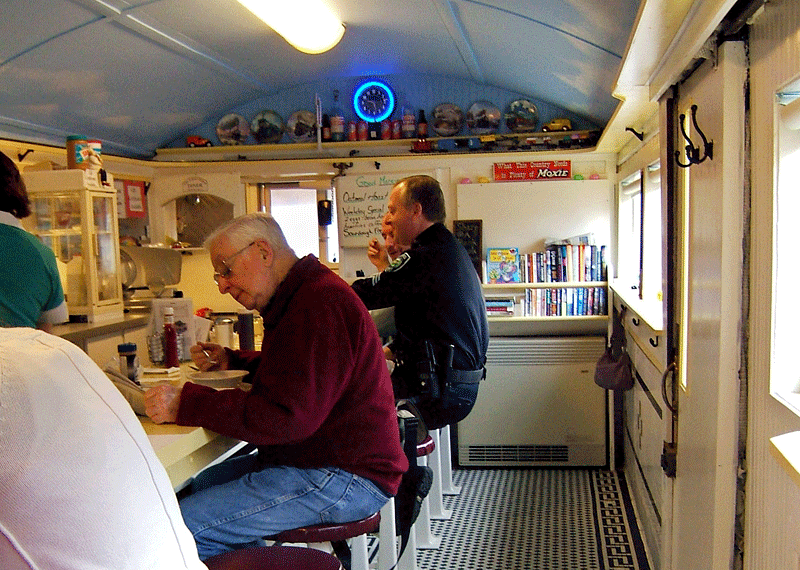 Built in 1929 by the Worcester Lunch Car Company, this diner car was moved to its current location in 1950 where it has had a succession of owners, most recently Jim and Judy Miles who re-opened the diner just over a year ago. 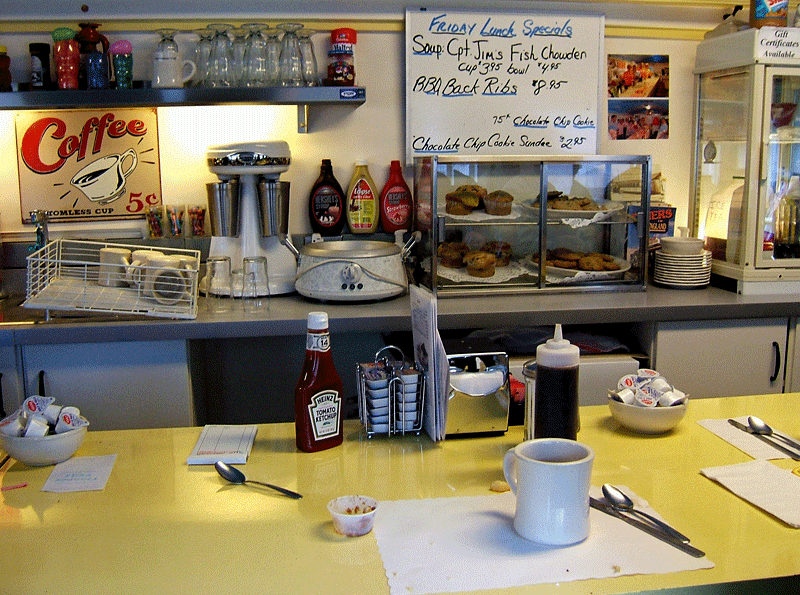 The menu is small and straightforward, with all the usual diner fare, though I was sad to see they don’t offer waffles, one of my personal favorites. The counter was almost full with locals and regulars chatting, and every meal I saw go by looked generous and tasty. I decided on the little stack of pancakes (2 for $3.75) with a side of homefries ($1.50) and bacon ($2.50) The homefries were a bit bland, but the the bacon was terrific, crisp and plentiful, and the pancakes were large and dense. I opted to try the Special Butter, which turned out to be a brilliant decision. The maple caramel cinnamon butter, whipped together on site, was absolutely delicious on the pancakes. The coffee is quite respectable, rich and fresh ground, and for those on the run, diner features The Honest Cup of Coffee, a self-serve station for take-out coffee at the bargain price of $1. (They are a cash only business, but there’s an ATM just around the corner.) If you want your breakfast to go as well, take out is available. On weekdays, the diner serves both breakfast and lunch, open 7 a.m. until 2 p.m. On the weekend, they serve breakfast only and close at 12 p.m. The lunch specials sounded great, and there’s no doubt you’re in Massachusetts because one of the sandwiches offered is the infamous Fluffernutter. 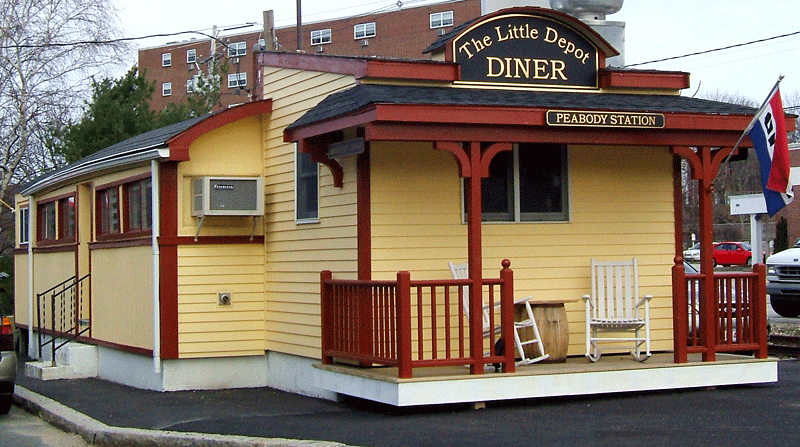 The Little Depot Diner is a place that just plain makes you feel good. Even without the siren call of that luscious Special Butter luring me back, I’d still return and bring my friends. Welcoming and comfortable with tasty food at good prices, this car is on the right track. Sure, it’s a chain, but we felt compelled to check out the PF Chang’s that just opened at the North Shore Mall. Asian food with a twist is one of our all-time favorites, and Chang’s did not disappoint. The decor is inviting and comfortable, modern with a nod toward Chinese cultural roots. We found the lighting on the dark side at lunch, however. The menu is well organized and interesting, with old favorites like Peking Dumplings, new items like Chang’s Wedge salad, and desserts that go beyond pineapple chunks to include banana spring rolls and adorable $2 mini desserts in tall shot glasses. Overall, the food was delicious, obviously made with fresh ingredients by chefs that put an emphasis on flavor. We enjoyed the dumplings and won ton appetizers but went crazy over the chicken lettuce wraps. The filling is chopped chicken and water chestnuts in an excellent sauce that we scooped feverishly into lettuce leaves. For entrees, we sampled the wok seared lamb, mu shu chicken, and fried rice. The lamb was tender and flavorful, and the fried rice had a wonderful ginger flavor. The mu shu was outstanding–far from the shredded cabbage version we’re used to. This had large chunks of lightly battered chicken and mushrooms, along with a nice selection of crisp-tender vegetables. On the downside, the prices are fairly high for lunch (the mu shu was $11.50 and the lamb was $14), and the service, although friendly, suffered from severe green-ness. True, we were there with a big group for an office outing, but since the server had not marked which person ordered which dish (and didn’t recognize some of the dishes by sight), getting the food on the table was more comedy act than elegant ballet. If you’re an Asian food lover and prefer light flavors to heavy sauces, we recommend giving Chang’s a try. Go for dinner, sit in one of the cozy-looking booths along the back wall, and order hot tea–it comes in a beautiful cast iron pot to cheer you and warm your hands on a frigid winter night.